The darkness is upon us. Soon it will be dark most of the time and I will be counting down the days until we near the celebration of the birth of Jesus when the days start getting longer. I remember when I was a young girl the days were already short and dark by 4:30 in October. Now that daylight savings time is extended this doesn’t happen until November. Setting my clock back … Sunday will suddenly be dark an hour earlier and I will contemplate going tanning to get my sunlight. It is unlikely I will actually go tanning but I consider it every year when the darkness comes. Today seemed dark all day. It was dark when I went to work and I noticed I had a headlight out. It was cloudy, dreary, raining and threatening to flood this weekend as I headed home for the day. At work, where I care for the elderly who are memory impaired, we have several nearing death. It happens every year, nearing the end of the year and the holidays, that people depart this world for the next. During a recent trip to Colorado (where I did not see the Dalai Lama since he had to go back to India and I didn’t have tickets anyway) the dreary weather followed us and we had dreary, grey, cloudy rain for three days. 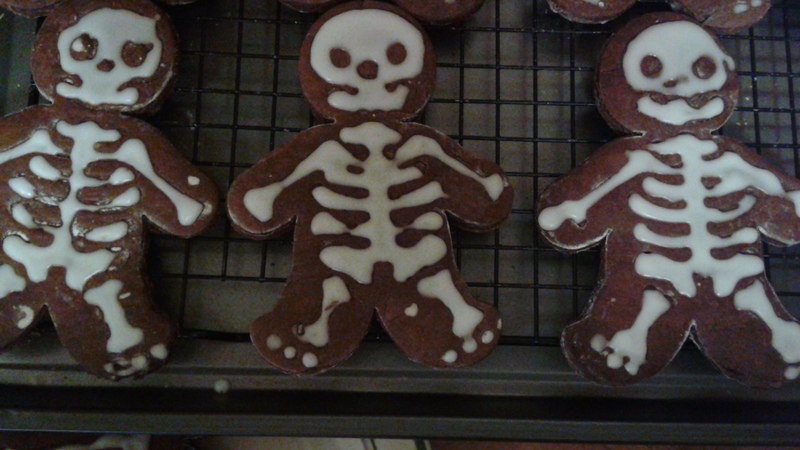 On one rainy day at a candy shop I found a cookie cutter called Gingerdead Men. It was a typical gingerbread man cut out with a skeleton impression on the other side. I decided to purchase this item and made cookies the day after returning home. Like all my cooking adventures, this was less than perfect but still fun. The Gingerdead Men made the darkness more fun. I enjoy the darkness as a time to stay inside with family and contemplate a great many things. I dread the darkness as a time to be trapped inside while it is cold, wet and dark outside. I enjoy the darkness as a canvas for lights and revelry. I dread the darkness as a time when depression tries to take me. We are coming up on Halloween (All Hallows’ Eve) and I think of All Souls Day. This is an interesting day when the living pray for the souls of those departed to get them into Heaven (if they are not yet there). Interesting to think that we could have such power to pray our loved ones into Heaven. I’d like to think that when we depart all becomes new and forgiven and we go to the place we belong within the divine no longer of ourselves but one with the divine until such time comes to be mortal (into the darkness) once again. This entry was posted in waxing philosophical and tagged All Souls Day, Dalai Lama, darkness, death, depression, forgiveness, Halloween, heaven, Jesus, mortality, reincarnation, sprituality. Bookmark the permalink. All the feast you are mentioning here are heathen festivals from which Christians should abstain. When you say the “departed to get them into Heaven ” what would be the use of Jesus at his return calling all from the graves to be judged? In the Bible it says clearly what happens when we die. We become nothing again. We shall not be able to think or do anything; We all just shall come to deteriorate, falling under the decay, becoming dust. All I am saying is that it is interesting to think that we have such power as humans as to make a difference as to whether or not another soul gets into Heaven. Seems it should be something up to God and not up to human intervention. Naturally it is God Who shall decide who shall reside where.